← Capitals vs. Islanders: Who would you rather face? 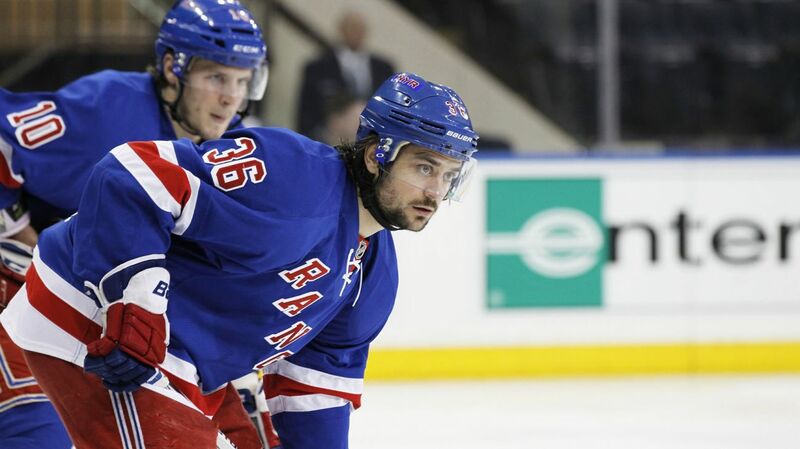 The Rangers will be without Mats Zuccarello for the time being, sidelined with what seems to be a concussion. Photo courtesy of MSG Photos. In Game 5 of the Eastern Conference Quarterfinals against the Pittsburgh Penguins, Mats Zuccarello was struck in the head by Ryan McDonagh’s slap shot. Play continued, and Zuccarello seemed a bit woozy getting back to the bench. A few minutes later, he headed to the locker room. This afternoon, the Rangers announced that Zuccarello would be out “indefinitely” with an upper body injury, not specifying any type of injury or the length that he would be sidelined. With that being said, losing Zuccarello definitely hurts the Rangers. He’s been a steady force on the top line alongside Rick Nash and Derick Brassard, with 15 goals and 34 assists in the regular season, including another two helpers in the first round. He’s an excellent playmaker, and a sparkplug with his physical play. But if there is one thing the Rangers have been capable of this season, its adapting to injuries. This is the same team that lost Derek Stepan for the first 12 games of the season, lost two top four defensemen for extended periods of time in Klein and Boyle, as well as being without their star goaltender for 25 games. The Rangers went on to win the Presidents’ Trophy despite all this. The only available winger in the reserves is James Sheppard, who did not play in the first round. Sheppard had six points (2-4-6) in seven playoff games with San Jose last season, and was one of their best players for them last year. He will almost certainly be reinserted into the lineup. 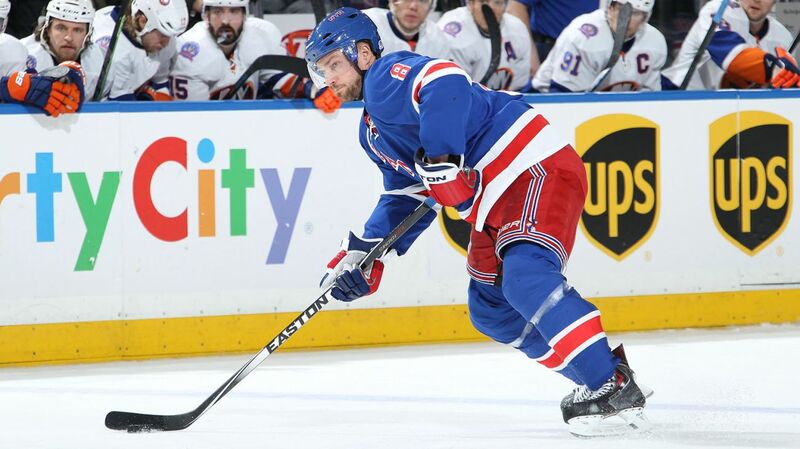 With Zuccarello out, deadline acquisition James Sheppard will likely be reinserted into the lineup for Game 1. Photo courtesy of Getty Images. Vigneault also said that the Rangers would recall a forward from the Hartford Wolf Pack after their playoff game on Tuesday, saying that they need “at least one spare” in the absence of Zuccarello. Oscar Lindberg and Ryan Bourque have been called up during the regular season, but there is one other forward that the Rangers should take a look at to try and fill the void left by Zuccarello. 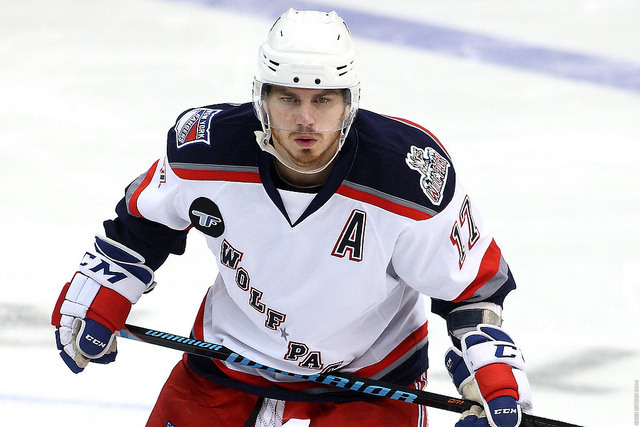 Chris Bourque, a 29 year old AHL journeyman, has been the Wolf Pack’s best player this season, leading the team with 66 points (29-37-66) on their top line. Bourque has also played in 51 NHL games, making him one of the more experienced forwards in the Rangers’ AHL system. While he only has two goals and six assists in those 51 games, Bourque has a 51.4% Corsi (possession stats), which is pretty solid for someone playing in a bottom six role at the NHL level. However, he has just a 93.5 PDO in those NHL games, which basically means that Bourque and his team didn’t get many favorable bounces when he was on the ice. Chris Bourque has been the best player on the Hartford Wolf Pack this season, leading the team with 29 goals and 66 points. Photo courtesy of the Hartford Wolf Pack. Bourque has been a really good scorer at the AHL level, with a good shot and skillset. Although he is just 5”8’, he is solidly built, with a low center of gravity that makes him hard to push off of the puck. In the past he has drawn comparisons to Brian Gionta due to his skating ability, great vision and crisp passing skills to find an open man. You can argue that it doesn’t make sense to place a player with little NHL experience and no playoff experience into a team headed into the second round, and that’s a valid argument. But Chris Kreider was inserted onto the top line during the 2012 playoffs without ever playing in the NHL, and wound up tallying seven points (5-2-7) in 18 games. The Rangers aren’t going to replace Zuccarello’s talent with James Sheppard. Sheppard doesn’t have the same skillset at Zuccarello, and is better suited in a third or fourth line role. So why not give Bourque a shot on the top line alongside two of the team’s best players in Rick Nash and Derick Brassard. Vigneault would be setting Bourque up to succeed in a role that he would probably do well in. In other news, Marc Staal and Keith Yandle were both absent from this morning’s optional skate. Staal is taking a maintenance day, and Yandle is dealing with “general body soreness,” likely still dealing with the end of the flu bug he had in the first round. Both will play in Game 1 of the second round. Kevin Klein also announced that he would be available to play in Game 1, marking his return to the lineup for the first time since March 11th, when he broke his arm blocking a shot in a game against the Washington Capitals. Kevin Klein will make his return to the Rangers’ lineup in Game 1, his first game since breaking his arm on March 11th against the Capitals. Photo courtesy of MSG Photos. Vigneault said that he likes to keep three right-handed shots on defense, so Dan Boyle would remain in the lineup and Matt Hunwick would be the likely scratch. Although Boyle has missed out on some opportunities in the first round, and could be a little better, he’s a veteran and knows how to bounce back from adversity. Boyle is also the best possession defender on the team, and an important defenseman on the team. Having Klein back adds another solid defensive player to the Rangers, someone that Vigneault trusts to play 16 to 20 tough minutes a game. It also balances out the offense and defense on the bottom pairing alongside Keith Yandle. These are the lines for Round 2 that Vigneault alluded to during his press conference today. This is what you should expect for Round 2. 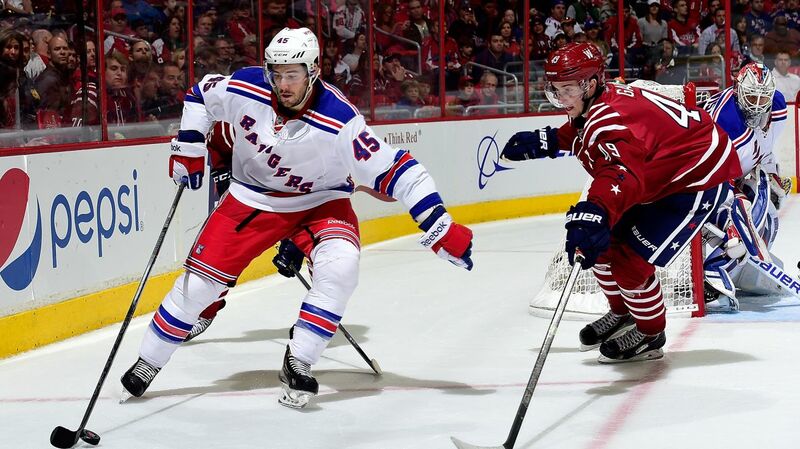 Posted on April 27, 2015, in Rangers Updates and tagged Alain Vigneault, Cam Talbot, Carl Hagelin, Chris Bourque, Chris Kreider, Dan Boyle, Dan Girardi, Derek Stepan, Derick Brassard, Dominic Moore, Hartford Wolf Pack, Henrik Lundqvist, James Sheppard, Jesper Fast, JT Miller, Keith Yandle, Kevin Hayes, Kevin Klein, King Henrik, Madison Square Garden, Marc Staal, Martin St. Louis, Mats Zuccarello, Matt Hunwick, MSG, MSL, New York Rangers, NHL, NHL 2014-2015 Season, NHL Playoffs, NY Rangers, NYR, Rangers, Rangers Nation, Rangerstown, Rick Nash, Ryan McDonagh, Stanley Cup Playoffs, Tanner Glass, The Ranger Zone. Bookmark the permalink. Leave a comment.